From October to January, drivers are at increased risk on Arkansas roads. It’s not due to snow or ice, the typical winter culprits, which make their appearance much less frequently in Arkansas than in more northern states. No, in Arkansas the real danger is one of our four-legged friends: the deer. If you live in Arkansas, chances are you know someone who’s hit a deer while driving, or you’ve experienced it yourself. Why does it seem to be more common in the late fall months? This is deer breeding, or “rutting,” season, so they are highly active and on the move during this time. While most of us would be far more afraid to come face-to-face with a lion or crocodile than a deer, hitting one with you car can cause extensive damage, both to you and your vehicle. Collisions are usually fatal for the deer, as well. The Insurance Institute for Highway Safety estimates that crashes with deer cause about $4 billion in vehicle damage each year, and close to 200 people are killed in deer collisions annually. Obviously, you would prefer to avoid hitting a deer in your car. Let’s look at some practical ways to do so. Meeting a Deer: What are the Odds? You are most likely to encounter deer along the roadside at dawn and dusk. It’s important to drive with heightened awareness during those times. You know not to use your phone while driving, especially at night, but even “zoning out” can put you in danger and cause delayed reaction times. Deer are more likely to frequent the roadsides in heavily wooded, less populated areas, but because so much of Arkansas is considered rural, they’ve been known to pop up in the middle of small towns and along busy interstates. Deer also rarely travel alone. If you see one deer, there will be others nearby. SLOW DOWN. This is our #1 tip to avoid hitting a deer. The more conservatively you drive, the more time you have to react if a deer darts out in front of you. 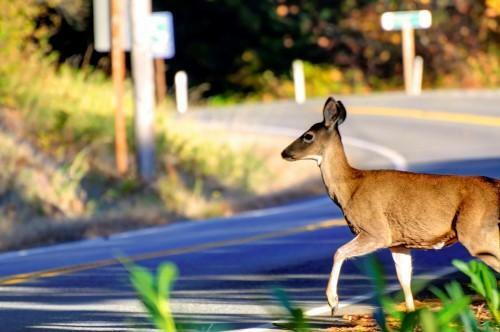 Watch for the “shine” of deer eyes reflecting along the sides of the road, and immediately slow down if you see some. If there’s no oncoming traffic, use your high beams to increase road visibility. The phrase “deer in the headlights” is based in fact: Deer often freeze in the road because they’re mesmerized by bright, steady lights. Flashing your lights can help break the trance, as can giving one long blast of your horn. Don’t swerve. Not only does swerving confuse the deer, but it puts you at risk for swerving into oncoming traffic, hitting a tree or ditch, and flipping your car, all of which pose more danger than the deer. Maintain control of the car and steadily increase your pressure on the brake – don’t “slam” the brake at the last minute. It’s hard to remember in the moment, but letting off the brake at the moment of impact is important. Braking can cause the front of your car to dip down, making it more likely that the deer will go through the windshield and seriously injure people in the car. Call police even if your car is the only one involved in the accident. It’s dangerous to touch the deer, which may still be alive, and you need documentation of the accident for your insurance company. Do you live in Arkansas, particularly in a rural area? You may want to consider opting in to Comprehensive insurance coverage, because deer are not covered under Collision. Comprehensive insurance also covers events like fire, storm damage, theft, and vandalism. At Taylor King Law, we can’t file a claim against the deer if you’re involved in a collision with one. But if you were the victim of a car accident where the other driver was at fault, you may have legal rights to compensation. We can help make complicated paperwork simple, handle insurance negotiations, and stand firm to be sure you get the settlement you deserve. Call today at 1-800-CAR-WRECK or submit a question through the Case Evaluation Form on our website.